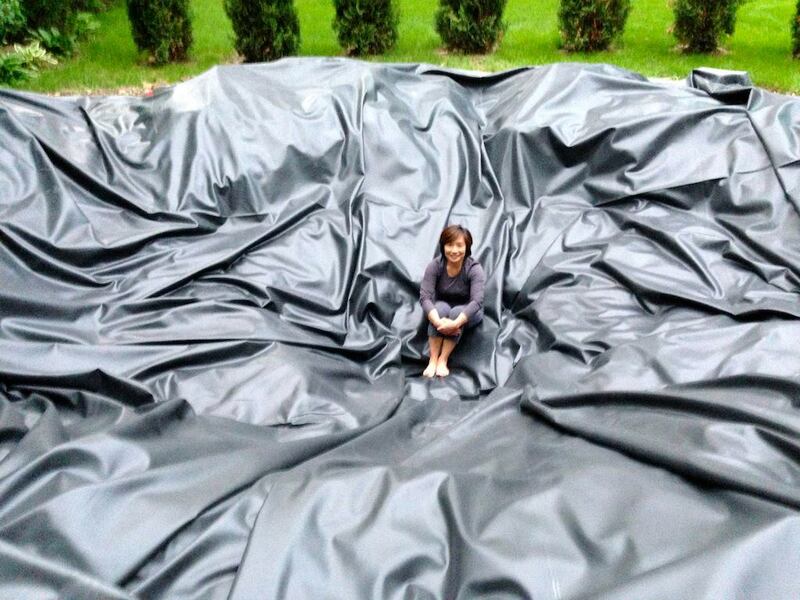 We were finally able to get some sandbags in between the raindrops and put down a pondliner. I’m not sure who was more excited, me or the koi! 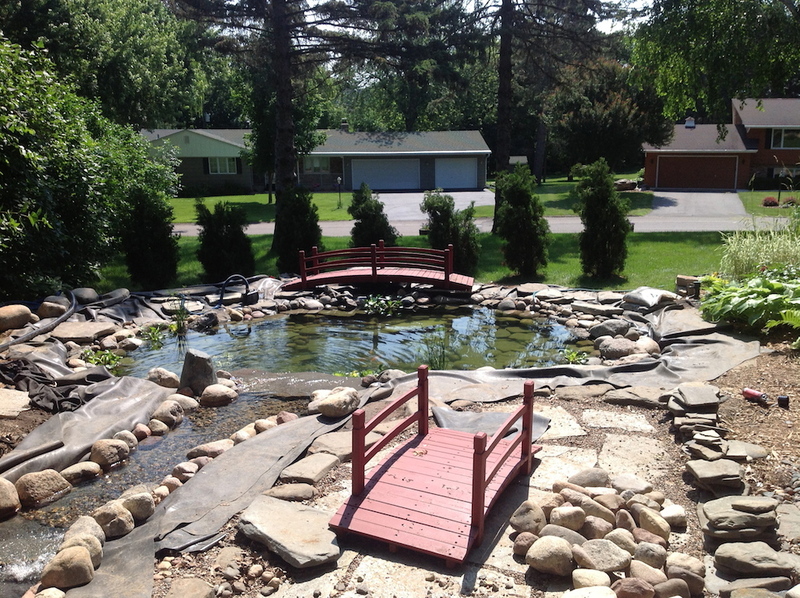 The pond was starting to clear and the waterfall had been reshaped, lengthened and running well. 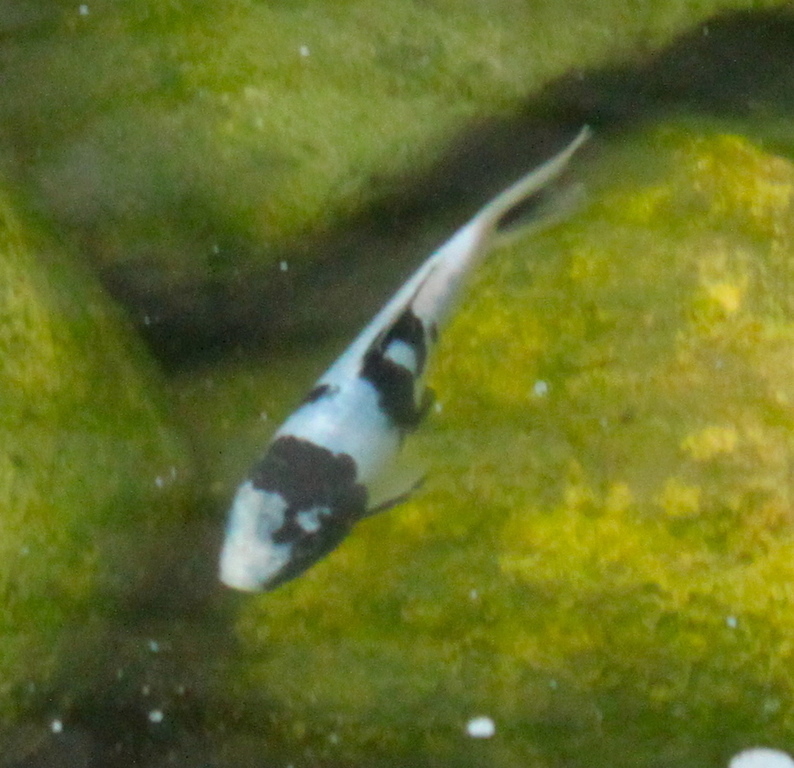 Just like a canary in a coal mine, we chose Pinto and Tito as the test koi. 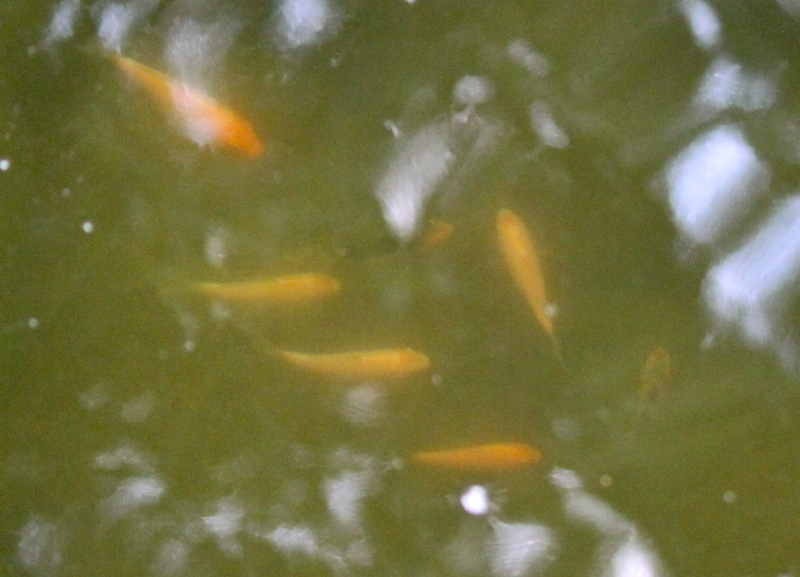 After a few minutes, it was clear they weren’t going belly up so the rest of the koi joined them. 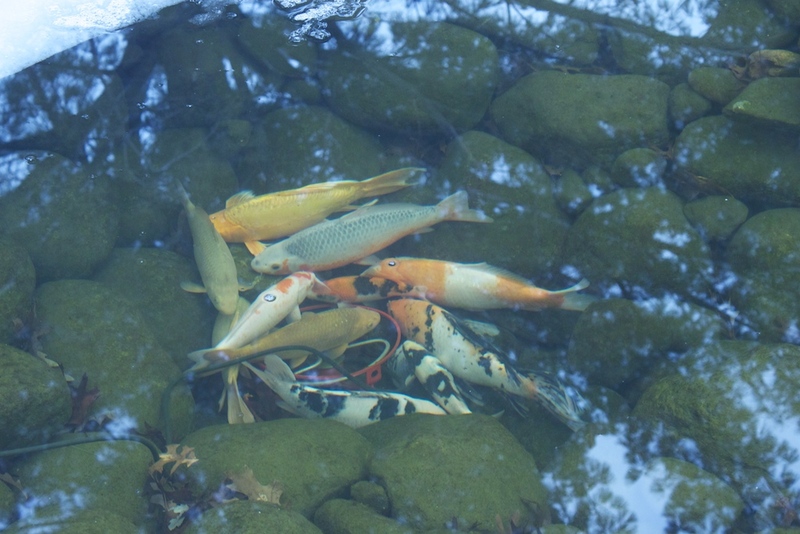 The koi had been growing the last few weeks in the polyvat and ranged in size from 8 to 12 inches. 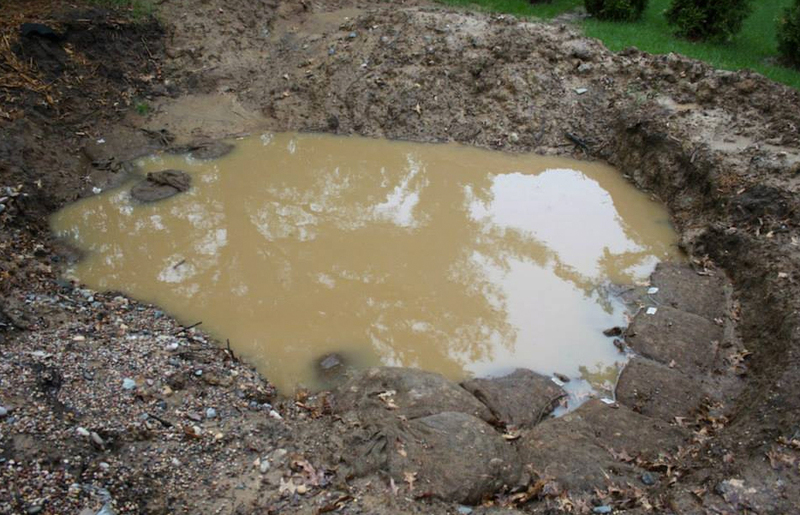 Remember the mexican beach pebbles that were a bad buy last year? 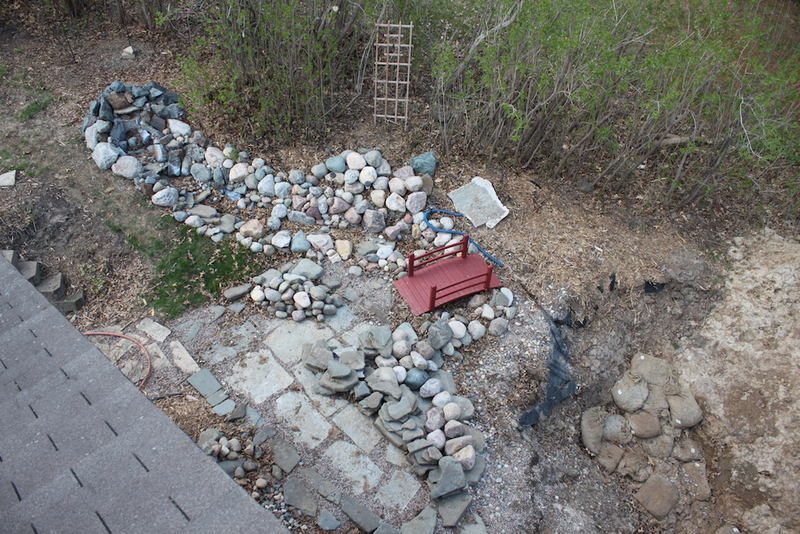 I reused them in the pathway portion of the pond area. Click on the photo below to see video. 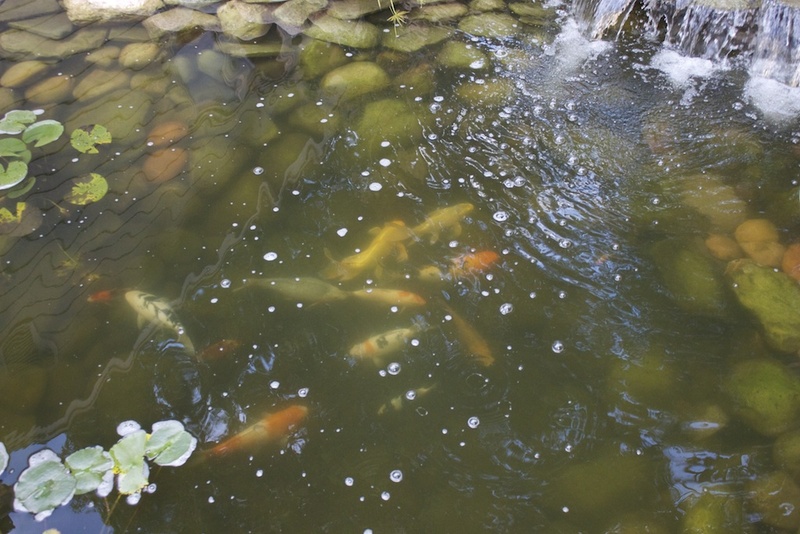 When the koi moved into the new pond I noticed they were acting strangely for a few days. 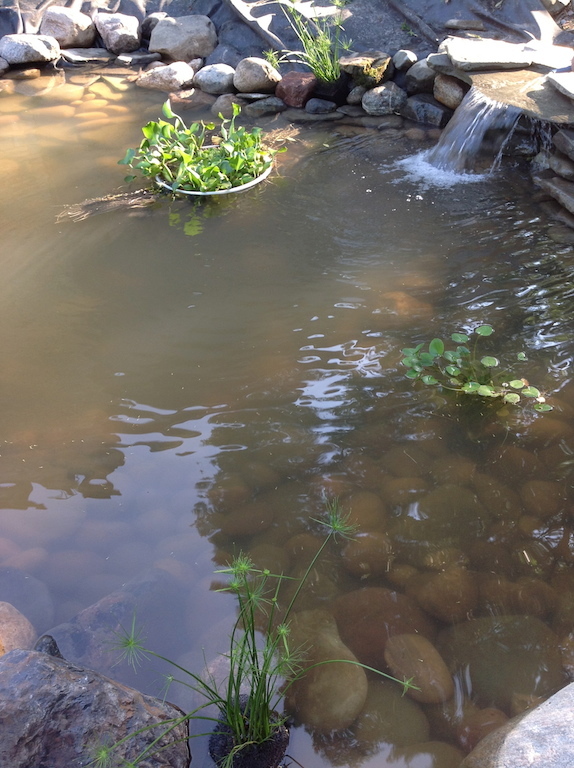 Some of them were chasing each other into the edge plants, swimming recklessly and after a little research, I thought they might have been spawning. The online research states that females tend to have rounder bodies and the males are generally slimmer. Hard to say with this crowd. We think Fatchiko and Tito might be the females. Frankenstein, Tarzan and Gunga Din act like males but who knows. I looked for eggs but saw none – of course most eggs get eaten in the wild by the adults so I promptly forgot about the odd behavior. 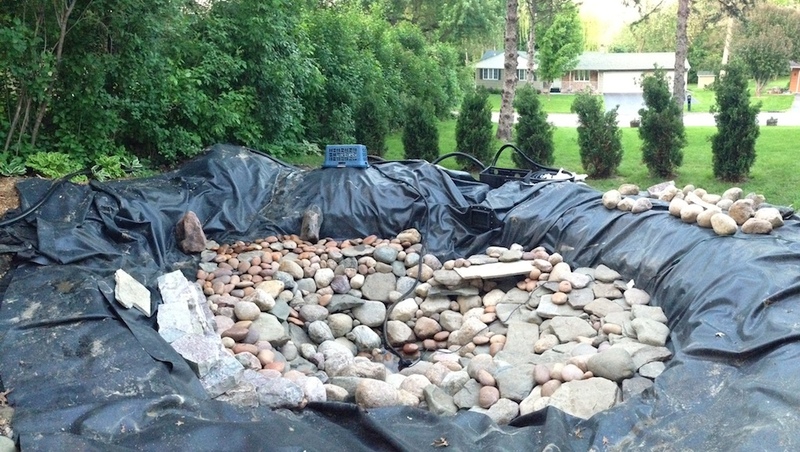 When it got really warm in the summer, my husband did some rock cleaning while sitting in the pond. 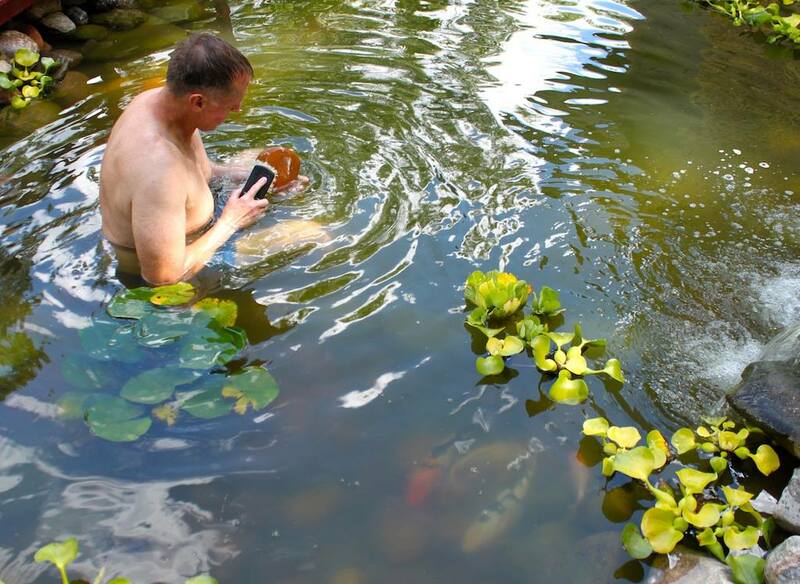 I’m not really a big fan of that and thought the koi would be unhappy. They actually did not seem to mind that someone was sitting in the pond with them. 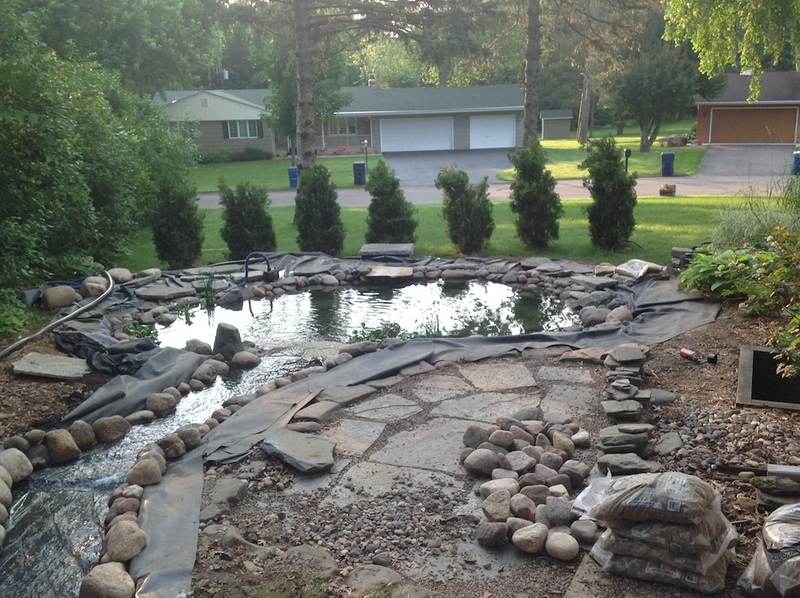 Once the plants were in, the steps done, the flagstones redone we added two more koi to the group, Moriarty (black and white) and Irene (red, black and white). Irene is the dumbest koi on earth. We found Irene with her head stuck under a rock not once but three times. 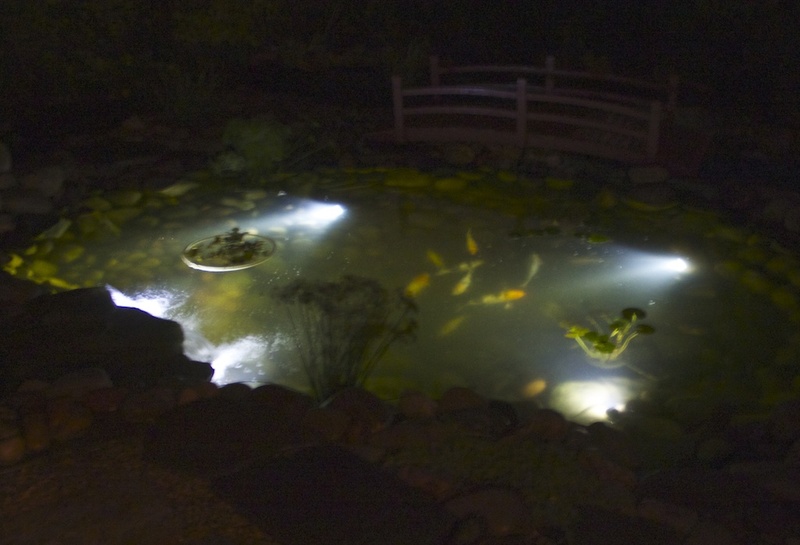 At night the pond lights come on automatically and the koi are very active at night. I’m not sure if they ever sleep, maybe around 3 am. A side project I started was trying to get moss to take on the rocks in the waterfall. 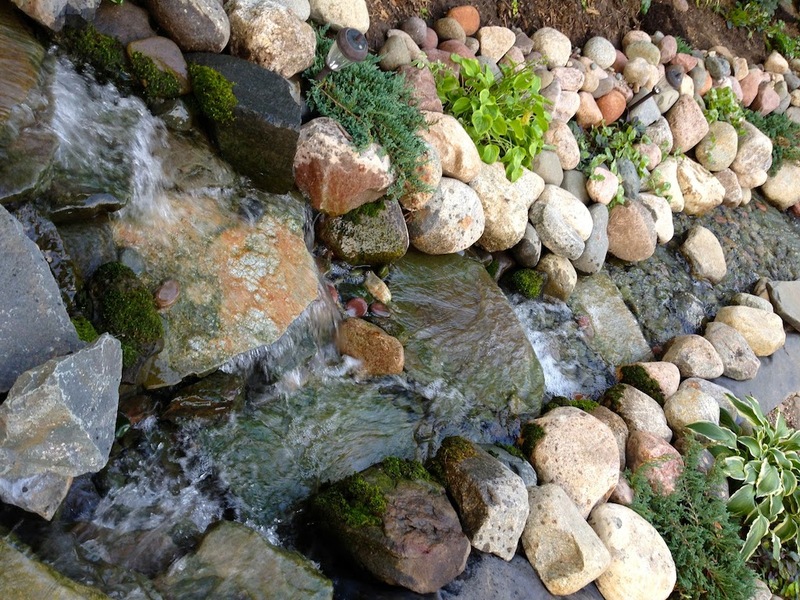 I would harvest large patches of moss from other areas of the garden and lay them on the rocks. It actually works. 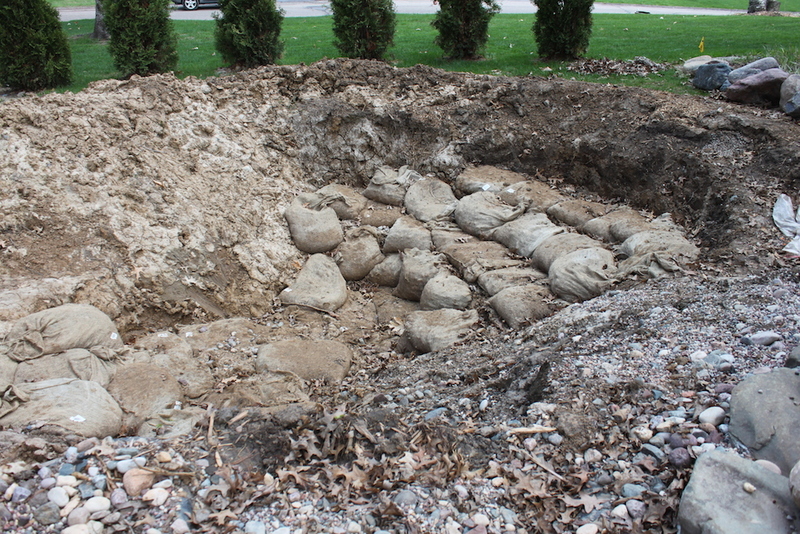 The test will be to see what they look like after the winter. 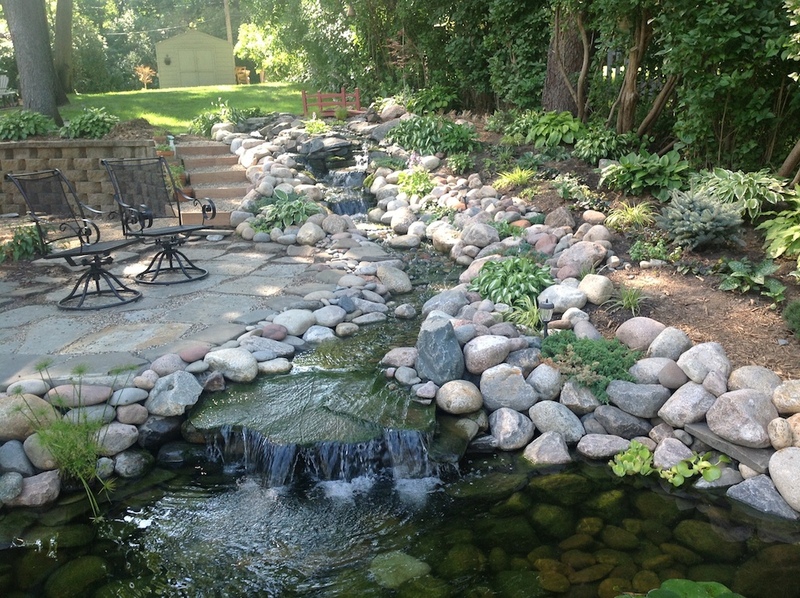 We finally turned off the waterfall just after we had a new window put into the side of our house. 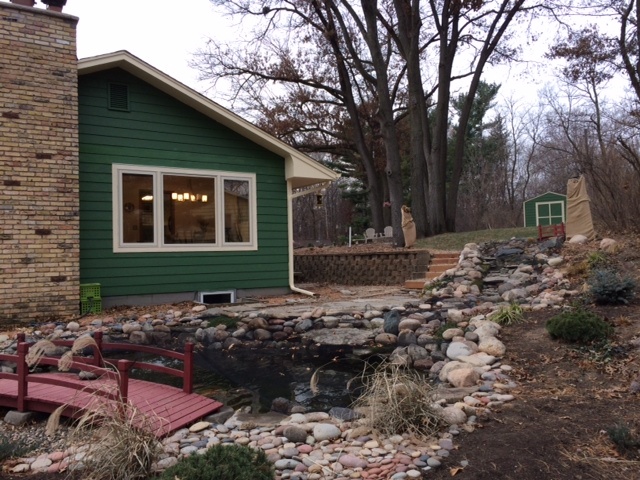 With all the work that went into this side yard project, it seemed to be a shame that the current window gave us a limited view of the pond. 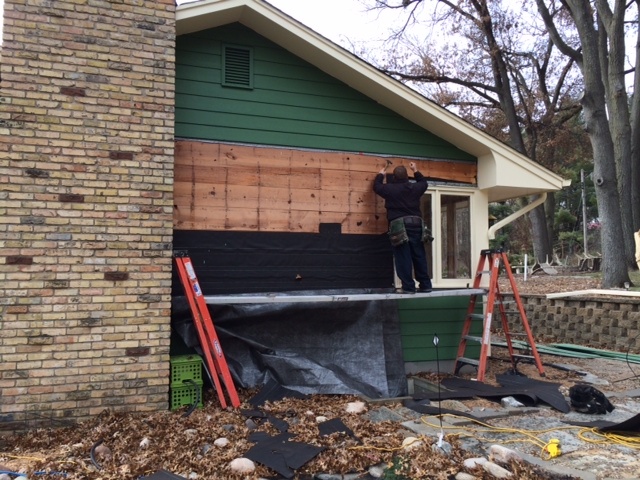 In early December, we had a picture window installed. 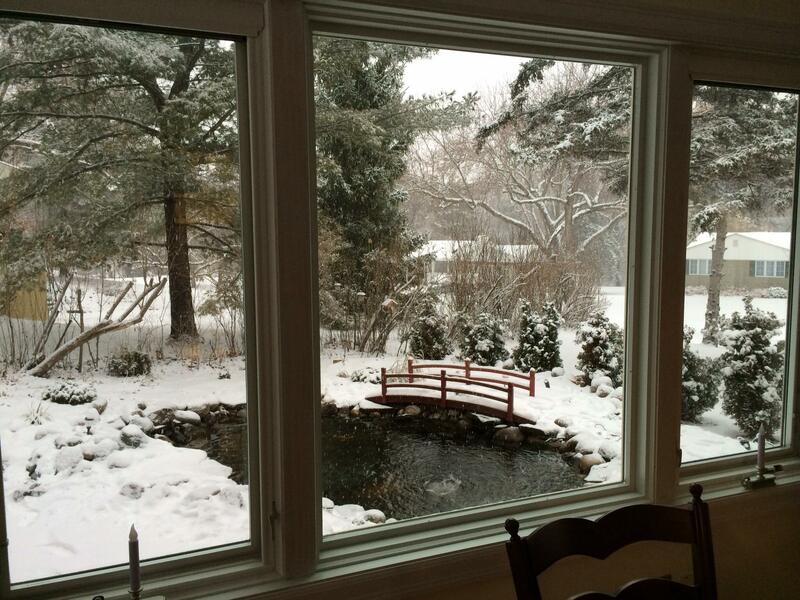 Only this time, it’s quite nice to see the snow falling on the pond through our new window! We have a little heater at the bottom of the pond and aerator going for oxygen. 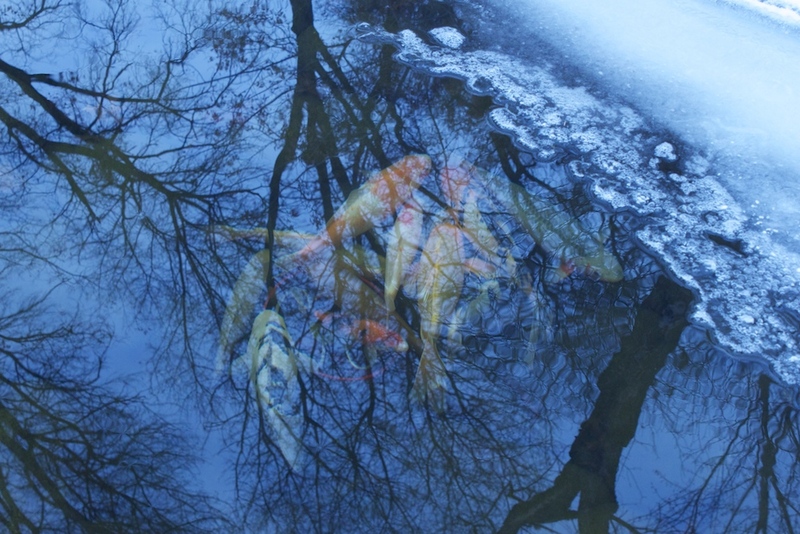 The koi have slowed down and generally hang out at the bottom of the pond around the heater. During the polar vortex, air temperatures dropped down to a windchill temperature of -45. 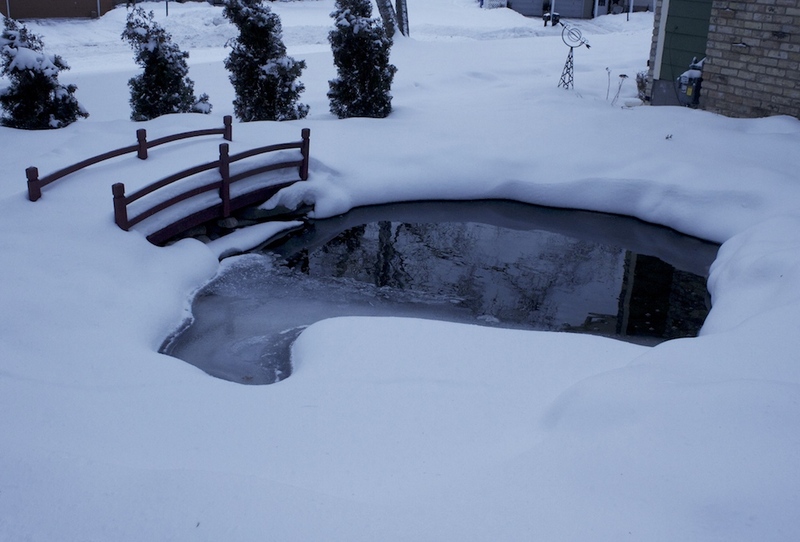 The pond ice opening varies and we were a little worried it might close up. We did feel compelled to throw a few buckets of hot water on the ice occasionally to keep it thin. 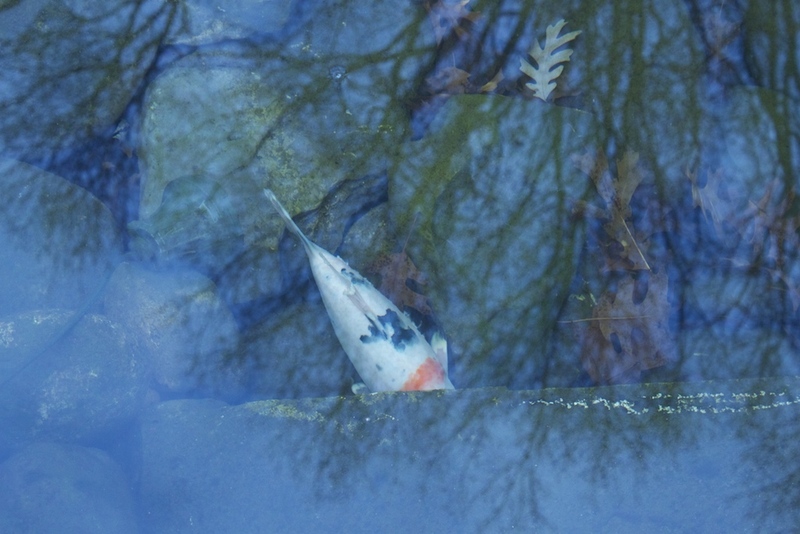 You might wonder why we just didn’t break it – koi can die when disturbed during their semi-dormant stage. 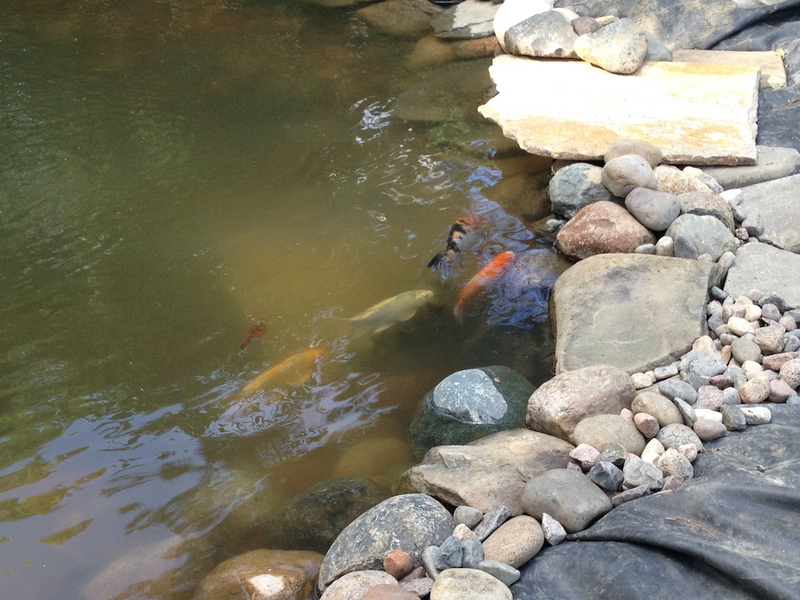 In January, we decided to check on the koi since it’s difficult to see them with the aerator going. 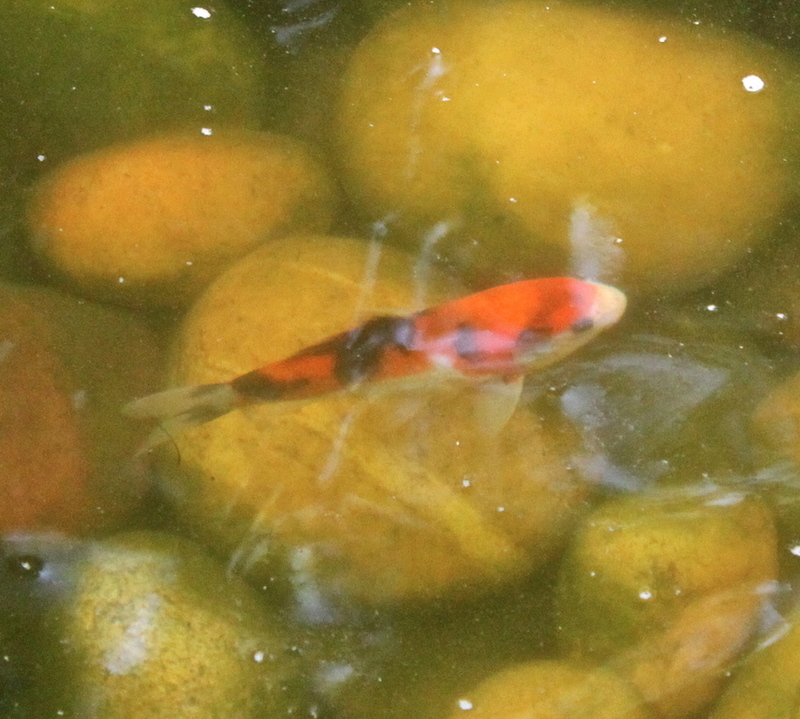 Sadly, we found one koi, Pinto away from the rest of the fish. Pinto was very weak and clearly diseased. We had to take Pinto out of the pond and he now lives in our compost pile 😦 Didn’t see any of the tiny koi but I’m hoping they will make it through the winter. 1. There is no need to handpick rocks. It’s better to have a few tons delivered to you. 2. 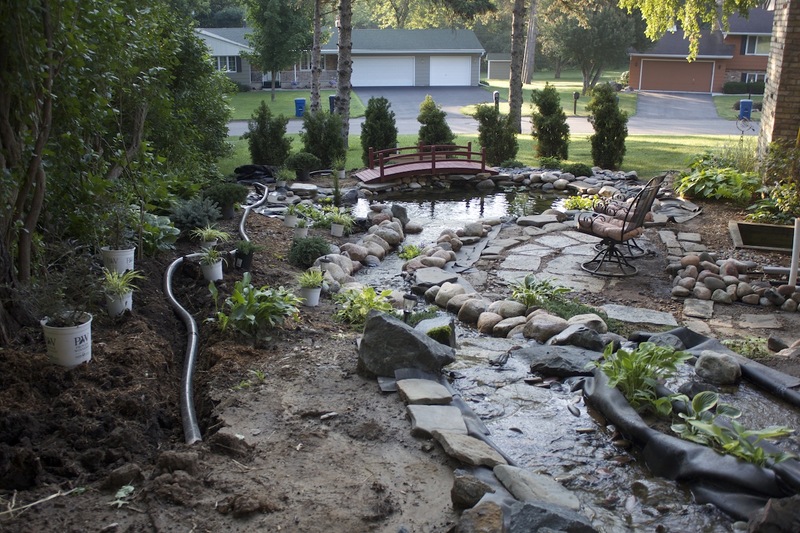 People like to stand at very edge of water, place some flat rocks that will accommodate this tendency along running water and the edge of the pond. 3. 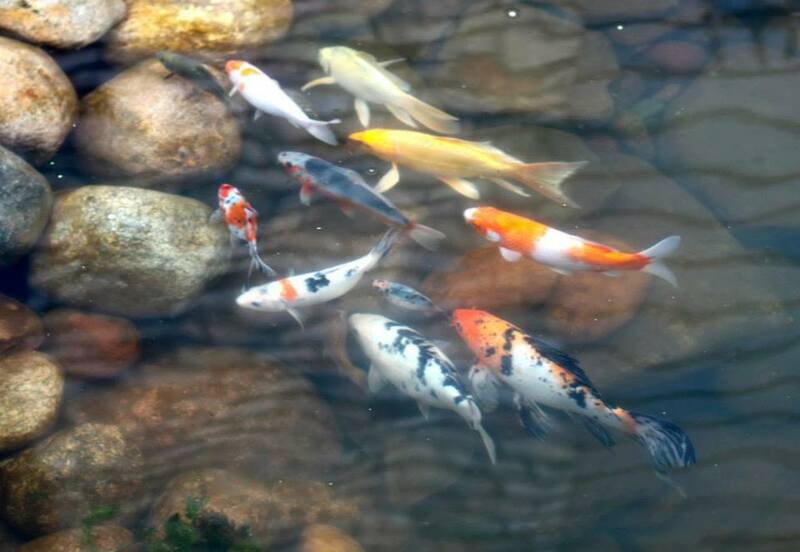 When fed properly, koi tend to grow quite rapidly (even goldfish can get pretty big). 4. Always buy multiples of more expensive plants and take a photo. It makes it a lot easier to return the plant that dies because you can show that they were planted at the same time under the same conditions. 5. 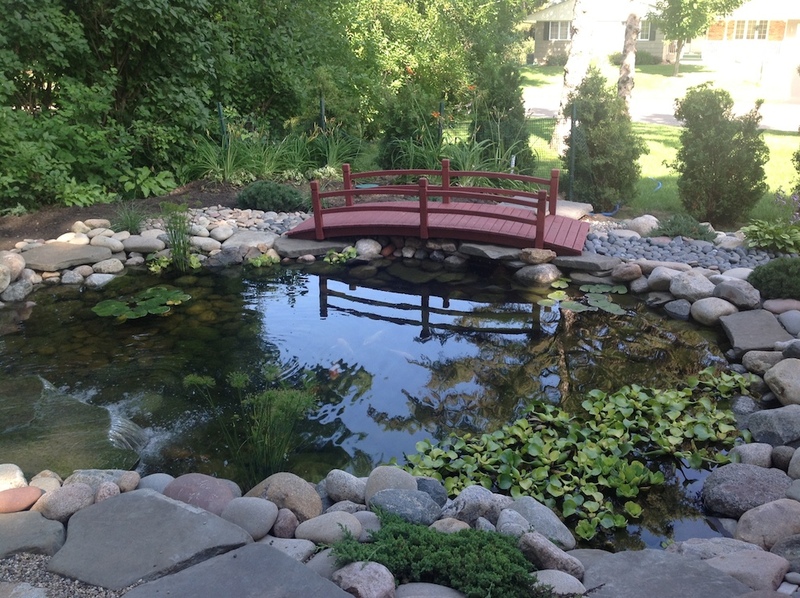 Puttering around the koi pond is a never-ending and extremely satisfying process.